Facebook Agrees To Set Friend Lists Free. Mashups With Twitter Lists Should Follow. 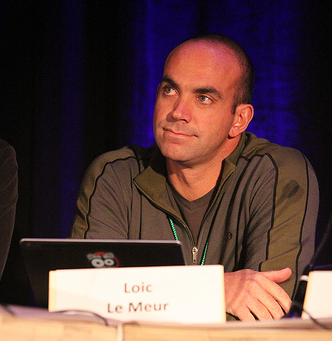 Today, during the Filtering the Stream roundtable at our RealTime CrunchUp, Seesmic’s Loic Le Meur asked why Facebook isn’t giving third parties access to their Friend Lists. Obviously, that’s a good question now that Twitter has starting giving third parties access to its Lists feature via an API. 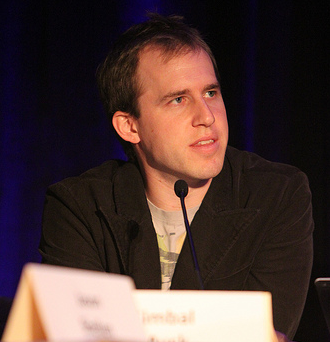 Normally, you’d expect a canned response along the lines of “we may do that in the future” or “we’re thinking about it,” but Facebook’s VP of Platform Bret Taylor was much more candid. Taylor said that Le Meur’s request seemed “reasonable” and continued “we should do that.” “We’re not working on that. But we should be,” he continued. So there you go, done deal. Great. 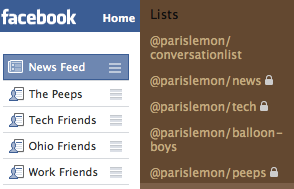 It would seem that soon, third parties should have access to the list filters that Facebook uses. Here’s why this matters. With services like Seesmic (Desktop) and Brizzly importing data from both Twitter and Facebook, the social graph for those services is starting to get messy. If there were a way to merge Twitter Lists and Facebook Friend Lists, third-party services could provide a valuable new service: Easy-to-make Facebook and Twitter social graph mashups. Granted, it seems unlikely at this point that either Twitter or Facebook will ever sync these lists with one another on their respective services. But as long as they’re willing to provide that data to third-parties, other companies should be able to do interesting things with it. The Lists, it seems, are starting to merge.